For tax purposes, as of 2012, this pattern is now available for download for free. 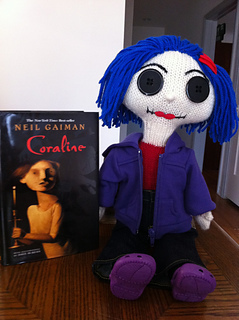 Knit your own “Little Me” Doll, inspired by the movie, Coraline. 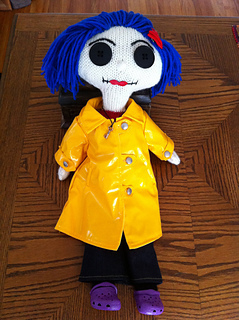 This pattern is for the doll only, including facial features and hair. Other doll clothing and accessories, e.g, skirt, blue jeans, hoodie, necklace, hair bow, shoes were purchased separately; sized for 18 inch dolls. 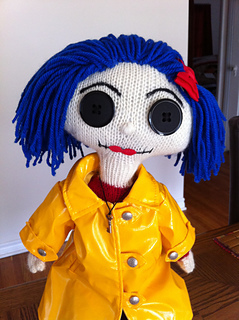 You can dress your Little Me Doll to look more like the original Coraline character by changing the colors of her shirt/torso, wearing a yellow raincoat and jeans, with a dragonfly barrette in her hair. This pattern is made with worsted weight yarn. You will need approximately 200 yards of MC, 200 yards for hair, 100 to 150 yards for the torso and arms, and 100 to 150 yards for the legs. All body parts are knit in the round with US Size 6 needles and/or dpns. 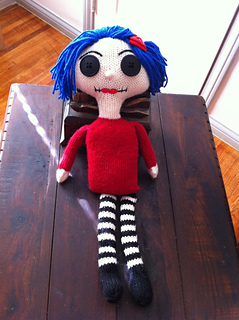 Your finished Little Me Doll will be 19-20 inches in length. 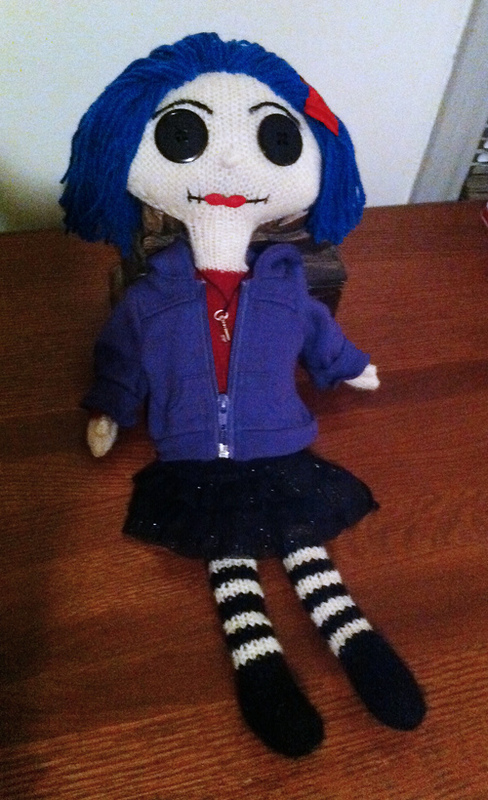 Facial features are sewn, and/or embroidered. Hair is attached using a crochet hook.